Exfoliation syndrome (ES) is characterized by deposition of distinctive fibrillar material considered to be a product of abnormal extracellular matrix material metabolism in the anterior segment of the eye. The fibrillar material probably represents a generalized basement membrane disorder. 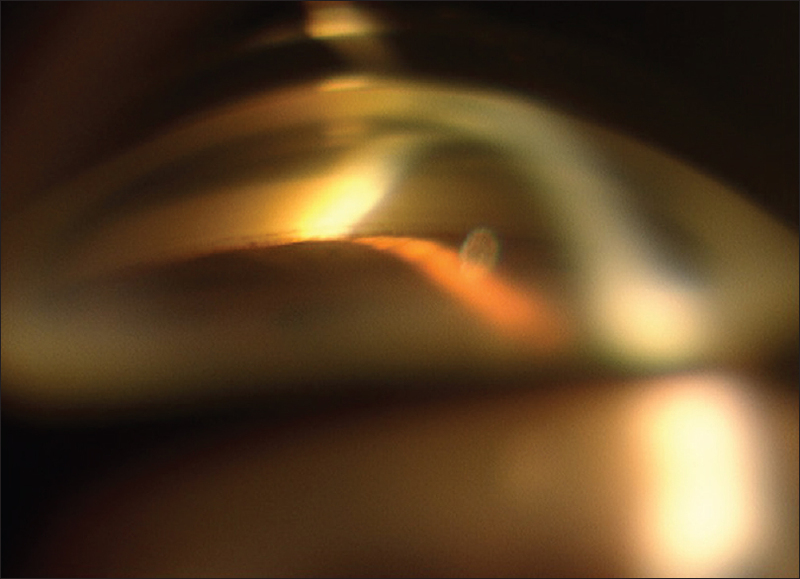 The material is deposited in a target-like pattern on the lens capsule best seen on pupillary dilatation. A central area and a peripheral zone are usually separated by an intermediate clear area due to rubbing off by the iris movement. However, in the setting of early or subtle findings, a careful examination on slit lamp is necessary to diagnose ES. The clinical findings may be detected only in one eye as are shown in many studies. ES is associated with a variety of findings on gonioscopy related to the amount of pigmentation of trabecular meshwork (TM), presence of exfoliative material, presence of Sampaolesi line, but also to the depth of angle. We undertook this study with the purpose of studying the gonioscopic findings of patients with ES. This was a hospital-based case series study including that all patients detected with ES from among consecutive 2000 patients above the age of 40 years were examined in the ophthalmology outpatient department of a rural hospital in western India after approval by the Institutional Ethics Committee. Patients who had undergone cataract surgery and those with congenital or post a traumatic abnormality of anterior segment of the eye were excluded from the study. The relevant ocular and systemic history was recorded with special emphasis on history of skin disorders and cardiovascular diseases. The ophthalmic examination included recording of visual acuity, examination of pupillary reaction, slit-lamp examination, recording of intraocular pressure (IOP) with Goldmann applanation tonometer, gonioscopy with Goldmann 3-mirror gonioscopy, and fundus examination. Visual field examination was done in patients with IOP >21 mmHg. Out of a total of 2000 consecutive patients above the age of 40 years who were examined during the study period, 62 (3.1%) patients were diagnosed as having ES. Of these, 36 (58%) were male and 26 (42%) were female. The average age of the study population was 52 years, but the average age of the male and female patients diagnosed with ES was 65 and 70 years, respectively, with the youngest patient being 57 years old. The occupation of 32 (52%) of the patients with ES was farming. Four patients (6%) had a dermatological problem in the form of senile Xerosis. Eight patients (13%) were hypertensive, 6 (10%) were diabetic, and 6 (10%) patients had diabetes and hypertension. Exfoliation was present bilaterally in 24 (39%) patients. The average IOP of the study group was 19.34 ± 4.91 mmHg (14–24) on applanation tonometry. In eighteen patients (29%), the IOP was higher than 21 mmHg. The IOP was elevated in both the eyes in 12 patients (19%), with the eyes with ES showing higher average IOP (20 ± 6.16 mmHg) as compared to the eyes without ES (19.47 ± 4.39 mmHg) though the difference was not statistically significant (P = 0.56). The IOP was elevated in one eye only in 6 (10%) patients in whom the eye with ES had higher IOP. In 44 (71%) patients, the pupils did not dilate well. Nuclear sclerosis Grade II–III was present in the majority 56 (90%) of the patients whereas a small minority 6 (10%) had posterior subcapsular cataract. On gonioscopy, the anterior chamber angle was open in 56 (90%) patients of which 16 (26%) had wide open angle (Schie classification), 14 (23%) had Grade I open angle, and 26 (42%) had Grade II open angle. In our study group, only 6 (10%) patients had occludable angles. Deep pigmentation of the TM was seen in 54 (87%) patients. Sampaolesi line was seen in 56 (90%) patients of which 2 patients had two Sampaolesi lines [Figure 1]. Sampaolesi line was not detected in the six patients with occludable angles [Figure 2]. Exfoliative material was seen in the angle in 2 (3%) patients. 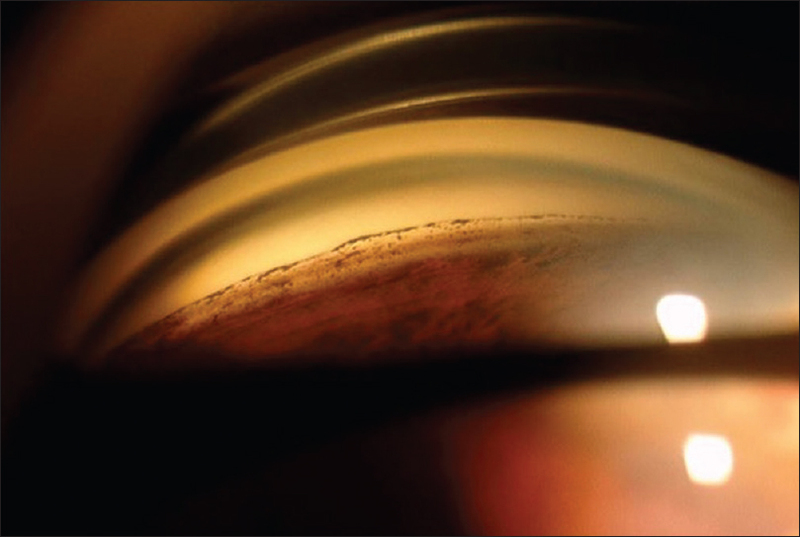 Laxity of the zonules detected on slit-lamp examination as phacodonesis and confirmed when operating for cataract was seen in 8 (13%) patients, but their angle was open. The fundus findings were unremarkable in all the patients. The visual field examination showed glaucomatous changes in one patient. ES is present worldwide with a variable prevalence. It is diagnosed by slit-lamp visualization of white powdery deposits on the lens capsule. The presence of exfoliative material is associated with an increased risk of developing glaucoma but can be present in the eye without associated glaucoma. This disorder has been known to have an association with narrow angles secondary to zonular weakness, increased rate and risk of cataract formation, and increased risk of complications during cataract extraction associated with zonular dehiscence. The prevalence of ES is variable not only from country to country but varies regionally within a country. A previous hospital-based study from India has reported a prevalence of ES as 7.4% whereas another study from South India has reported a prevalence of 3.8%, which is similar to our results which show a prevalence of 3.1%. The average age of our study population was 52 years, but the average age of those with ES was 67.5 years. Previously published studies also report an age-related increase, with ES being reported to be less common below the age of 60 years. The mean IOP of the study population was 19.4 mmHg. The study shows that though 29% patients had IOP >21 mmHg, none of them showed glaucomatous optic disc changes, and only 1 (2%) patient showed glaucomatous field defects which are comparable to the prevalence rates of exfoliative glaucoma ranging from 0.07% to 14.2% shown in other studies. Ocular hypertension was seen in 27% of the study population which is comparable with the rate of ocular hypertension reported by another study to be 22.7%. However, in a study conducted on 100 consecutive patients with ES, glaucoma was detected in 7% and ocular hypertension in 15% patients. Nuclear sclerosis Grade II–III was the most common associated finding in the lens. Other studies have also noted this association although the occurrence of nuclear sclerosis type of cataract may be a natural coincidence because of increased age or maybe because of increased oxidative stress in the anterior segment of the eye. ES has been associated with a number of findings related not only to the appearance of the angle but also to the depth of the angle. In our study population, 90% patients were found to have open angles as are agreed upon by most other studies. In our study, the prevalence of occludable angles is 10% that is within the range of prevalence of 9%–18% of occludable angle reported by other studies. Deep pigmentation of the TM, believed to be due to rubbing off of the iris undersurface, was seen in a large majority of the study population whereas deposition of exfoliative material was seen a very few patients. Pigment accumulation in the angle is considered to be pathognomonic of ES and is seen as Sampaolesi line and dense dark uneven pigmentation of the TM. However, in our study population, the presence of Sampaolesi line was a consistent finding in all the patients of ES with open angles but not in those with occludable angles in whom the line was not detected. This finding has not been reported in any other study. However, this observation needs to be studied further in a large sample size and may not be considered conclusive. If other studies report similar findings, then there is a need to undertake studies to understand the dynamics involved in deposition of pigment in the form of Sampaolesi line and its relation with the depth of the angle. Increased pigmentation of the TM has been correlated with increased IOP., However, in our study, no such correlation was found. In many of the patients showing dense pigmentation of TM, the IOP was normal. Laxity of zonules suspected on slit-lamp examination due to phacodonesis and confirmed while performing cataract surgery was seen in a small minority of study group although their angles were open which may be explained by the fact that the laxity was present over a small extent which did not lead to marked phacodonesis and subsequent narrowing of angle. On the other hand, the patients detected to have occludable angles did not have laxity of zonules. Since we did not come across similar studies, we could not compare the findings. Moreover, the sample size was small. Open angles showing dense pigmentation of the TM and the presence of Sampaolesi line were the most common findings on gonioscopy in a large majority of patients with ES. Sampaolesi line was not seen in patients having occludable angles. Allingham RR, Damji KF, Freedman SF, Moroi SE, Rhee DJ, Shields MB. Exfoliation syndrome and exfoliative glaucoma. In: Shields Textbook of Glaucoma. 6th ed. New Delhi: Wolter Kluwer; 2012. p. 248-62. Ritch R. Exfoliation syndrome and occludable angles. Trans Am Ophthalmol Soc 1994;92:845-944. Desai MA, Lee RK. The medical and surgical management of pseudoexfoliation glaucoma. Int Ophthalmol Clin 2008;48:95-113. Lamba PA, Giridhar A. Pseudoexfoliation syndrome (prevalence based on random survey hospital data). Indian J Ophthalmol 1984;32:169-73. Kozart DM, Yanoff M. Intraocular pressure status in 100 consecutive patients with exfoliation syndrome. Ophthalmology 1982;89:214-8. Karger RA, Jeng SM, Johnson DH, Hodge DO, Good MS. Estimated incidence of pseudoexfoliation syndrome and pseudoexfoliation glaucoma in Olmsted county, Minnesota. J Glaucoma 2003;12:193-7. Tarkkanen A. Pseudoexfoliation of the lens capsule. A clinical study of 418 patients with special reference to glaucoma, cataract, and changes of the vitreous. Acta Ophthalmol Suppl 1962;Suppl 71:1-98. Aasved H. The frequency of fibrillopathia epitheliocapsularis (so-called senile exfoliation or pseudoexfoliation) in patients with open-angle glaucoma. Acta Ophthalmol (Copenh) 1971;49:194-210. Ringvold A. Epidemiology of the pseudo-exfoliation syndrome. Acta Ophthalmol Scand 1999;77:371-5. Koliakos GG, Konstas AG, Schlötzer-Schrehardt U, Bufidis T, Georgiadis N, Ringvold A, et al. Ascorbic acid concentration is reduced in the aqueous humor of patients with exfoliation syndrome. Am J Ophthalmol 2002;134:879-83. Anastasios G, Konstas P, Hollo G, Rich R. Exfoliation syndrome and glaucoma. In: Schacknow P, Samples J, editors. The Glaucoma Book a Practical, Evidence-Based Approach to Patient Care. 1st ed. New York: Springer-Verlag; 2010. p. 507-17. Puska P. The amount of lens exfoliation and chamber-angle pigmentation in exfoliation syndrome with or without glaucoma. Acta Ophthalmol Scand 1995;73:226-32.